The XVII International Sauna Congress is starting 07.06. The International Sauna Association ISA is organizing the International Sauna Congresses every four years in different parts of the world in the countries where there are member associations. This XVII rights were given after a tight competition between China and Sweden finally to Swedish Bastuakademie. The organizing group headed by the Chairman of Bastuakademie Mr. Göran Honkamaa started its work about a year ago. Just now we are in a situation where we can see that the work has been succesfull and we have an outstanding program. Besides Honkamaa the important part of the work has been done by Hans Hägglund, Svante Spolander and Roger Häggström with Bastuakademie. ISA and ISA President Risto Elomaa has also been part of the organizing group controlling that everything is done according to the bylaws of ISA as well as the traditional practices. Over 200 people from about 24 countries have a full program starting on Thursday 07.06.2018 with an exciting full day smoke sauna tour to Soukolojärvi. Before the opening Get to Gether event, ISA is also having its Board and General meetings deciding e.g. the Board etc. for the next term of four years starting 2019. The get together event is a meet and greet for all those delegates that have come to the premises with an option to taste some local food and beer in the old Lapin Kulta brewery, Lappari which is today an important place for big events in Tornio. At the evening party grill food is served with the option to try several saunas at Kukkolaforsen. The event is important especially for Bastuakademie, because they have their 30 Year Anniversary. This means naturally that all the saunas in Kukkola are in full use also after the party. The estimate is that there are around 18 saunas available. On Saturday the day is further full of presentations and workshops. After these an important meeting of international journal of Sauna Studies IJSS will take place. The idea is to restart publishing sauna research and related papers in a journal like ISA and German Saunabund were doing for many years in the form of International Sauna Archive. Our friends in Australia have been doing a lot of basic work for this and we hope that in the meeting we can find a group that is willing to go further. After the official program there is again a party at Kukkolaforsen where this time the International Sauna Association is having its 60 Years Anniversary. After the three course dinner prepared and served in this famous restaurant, there is also music and other program. All the 18 saunas will be open as long as there is interest in using them. Actually the slogan Midnight Sun Sauna means that we use them until morning. This time of the year we have Midnight Sun in that region, as well. Once again ISA has succeeded in getting some of the key speakers in the sauna world to present the latest material about many aspects of sauna and sauna culture. Such names as Jari Laukkanen, Mikkel Aaland, Lasse Viinikka, Mark Timmerman are on the list. We are sure that the presentations give many new aspects for the sauna and how to use it. The presentations cover the globe from Sydney to Seattle like the delegates. And as delegates we also see people from Pakistan and Kenya, which are not traditional sauna countries. Japan delegation is a group of 20 people. Two of whom are also having presentations on Japanese sauna and sauna culture; The Japanese Sauna Ambassador Katsuki Tanaka as well as sauna entusiast and photographer Miki Tokairin both have been publishing books and articles about various sauna. We introduce the delegates some aspects of the Interbad exhibition which is happening in 2018 in Stuttgart. TyloHelo is talking about the history of sauna and especially sauna stoves when having their 100 Years Anniversary in 2018. Saturday is the SAUNA DAY in Sweden as well as in several other countries. This is celebrated by announcing the SAUNA PEACE in several languages. We have also succeeded in getting a group of whisking specialist from Lithuania to show their skills as well as give some oral presentations about whisking generally. This group, headed by Rimas Kavaliauskas, is there at Kukkolaforsen on Saturday afternoon and also on Sunday morning. Another interesting group with their own mobile Banya, headed by Egor Andrejev, is showing also whisking and other treatments as well as giving oral presentations about banya culture also on Saturday afternoon in Kukkolaforsen. This is something we are really waiting for. On top of all this, participants have a chance to participate in some of the sauna tours organized specifically for the delegates. Even fishing in the Tornio river is possible and the timing should be perfect for salmon migration. The host of Kukkolaforsen, Svante Spolander, with his group knows everything about fishing and nature, further his wife will be making sure that the restaurant there is having excellent and absolutely fresh local food available all the time. One special aspect for many foreigners is the fact that the Congress is happening in two different countries and you will be crossing the boarder several times when moving from the hotel to congress and further to Kukkolaforsen. Tornio river has been the boarder between Finland and Sweden for over 200 years but the saunas are similar on both sides and there is even one common language still spoken. We hope that the visitors can bring some of that sauna culture and nice experiences with them back when going home. During serious sauna bathing, the majority of time is spent outside the actual hot sauna room. However modest your sauna may be, you have to take into account in its design phase how to get hot water, where the bathroom is going to be, and where your clothes and towels can be neatly stored. This article works as a reminder for the auxiliary space requirements for the sauna. It introduces models for a modest and a luxury version of sauna structures as typically found in Finland. As I’ve been creating Saunologia.fi for over two years, I have written a number of articles contemplating the sauna experience from many different angles. For the most part I have devoted writing about the hot sauna room and perfecting it in the Finnish style. Recently I have realized that the hot sauna room is only an ingredient, albeit the most important ingredient, in a wholesome sauna bathing experience. At least a typical Finn is spending at least as much time outside the hot room as s/he is spending inside one. the word steam room is frequently used outside Finland to refer to totally different types of baths so this story uses the term hot room to refer to the heart of the sauna building or facility. At a public sauna establishment there can naturally be many saunas, dressing rooms and bathrooms. At Saunologia, I have chosen a residential point of view, so I will next introduce two versions of saunas, a modest sauna individual use outback and a more luxurious sauna for both individual use and socializing. A note about the terminology in the picture: the simple cabin has no running water, so it has a separate outhouse for toilet needs. The luxury sauna facility resembles a modern detached house in all of its functions. There is a rule of thumb according to which the shower room must be 1.5 times bigger than the sauna room and the dressing/ locker room should be twice as big as the sauna room. The calculation of the room sizes starts with the hot room. It should be designed considering how many people will be using the sauna at once. In Finland, tiny apartment saunas may only accommodate 2 people, but most private saunas can seat 4 to 6 people at a time. 50 sq ft is barely enough for that. The logic of sizing the other rooms is based on keeping them spacious. It is expected that people flow through the rooms at different paces. This means that your design may start from a four person hot room, but have three more people in the shower or dressing room, who eventually crash in the dressing room at once. Having enough space for all supports relaxation and feeling at ease in the sauna. A public sauna requires professional cleaning and maintenance. Cleanliness is one of the core elements in a Finnish sauna. Even a personal sauna should have a cleaning closet, where the sauna’s cleaning supplies are held. It doesn’t have to be big as long as it keep things neat and tidy, preventing equipment laying around in the sauna. Naturally you also need a trash bin for empty bottles, caps and other trash. Lockers are the tidiest alternative for organizing the dressing room, but might feel strange in a private sauna space. Regardless, there need to be enough hooks and shelves for all sauna bathers. Warm water is needed in a Finnish style sauna. A rule of thumb is that you need 2.5 gallons of hot water per sauna bather, which gives you around 5-7 gallons of warm water for people to wash themselves. If only quick showers are needed, water consumption is less. 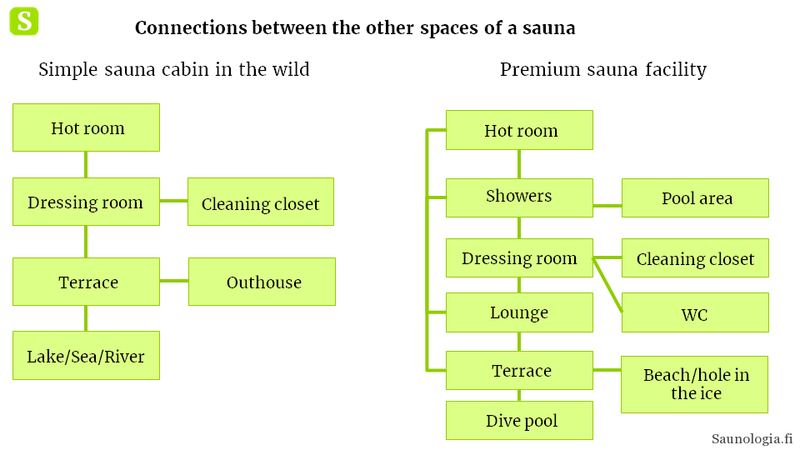 Most saunas in Finland have a separate room for washing, which allows to use a shower stall for instance. Washing up inside the hot room is possible if you allocate enough space (10 sq ft or more) and have enough vertical space so the temperature at the floor level can be kept moderate. To sum things up, let’s create a check list of what could be needed to set up a working sauna establishment. Things like a mirror and a trash bin are important to remember, also one could have a dedicated shelf for eyeglasses as the Germans do.